Over the past century, the United States has become an increasingly urban society. The changes in land use associated with urban development affect flooding in many ways. Removing vegetation and soil, grading the land surface, and constructing drainage networks increase runoff to streams from rainfall and snowmelt. As a result, the peak discharge, volume, and frequency of floods increase in nearby streams. Changes to stream channels during urban development can limit their capacity to convey floodwaters. Roads and buildings constructed in flood-prone areas are exposed to increased flood hazards, including inundation and erosion, as new development continues. Information about streamflow and how it is affected by land use can help communities reduce their current and future vulnerability to floods. Flooding in Hickory Hills, Illinois, prompted the construction of a reservoir to control runoff from upstream areas. Source: Loren Wobig, Illinois Office of Water Resources. Streams are fed by runoff from rainfall and snowmelt moving as overland or subsurface flow. Floods occur when large volumes of runoff flow quickly into streams and rivers. The peak discharge of a flood is influenced by many factors, including the intensity and duration of storms and snowmelt, the topography and geology of stream basins, vegetation, and the hydrologic conditions preceding storm and snowmelt events. Land use and other human activities also influence the peak discharge of floods by modifying how rainfall and snowmelt are stored on and run off the land surface into streams. In undeveloped areas such as forests and grasslands, rainfall and snowmelt collect and are stored on vegetation, in the soil column, or in surface depressions. When this storage capacity is filled, runoff flows slowly through soil as subsurface flow. In contrast, urban areas, where much of the land surface is covered by roads and buildings, have less capacity to store rainfall and snowmelt. Construction of roads and buildings often involves removing vegetation, soil, and depressions from the land surface. The permeable soil is replaced by impermeable surfaces such as roads, roofs, parking lots, and sidewalks that store little water, reduce infiltration of water into the ground, and accelerate runoff to ditches and streams. Even in suburban areas, where lawns and other permeable landscaping may be common, rainfall and snowmelt can saturate thin soils and produce overland flow, which runs off quickly. Dense networks of ditches and culverts in cities reduce the distance that runoff must travel overland or through subsurface flow paths to reach streams and rivers. Once water enters a drainage network, it flows faster than either overland or subsurface flow. Streamflow in Mercer Creek, an urban stream in western Washington, increases more quickly, reaches a higher peak discharge, and has a larger volume during a one-day storm on February 1, 2000, than streamflow in Newaukum Creek, a nearby rural stream. Streamflow during the following week, however, was greater in Newaukum Creek. With less storage capacity for water in urban basins and more rapid runoff, urban streams rise more quickly during storms and have higher peak discharge rates than do rural streams. In addition, the total volume of water discharged during a flood tends to be larger for urban streams than for rural streams. For example, streamflow in Mercer Creek, an urban stream in western Washington, increases earlier and more rapidly, has a higher peak discharge and volume during the storm on February 1, 2000, and decreases more rapidly than in Newaukum Creek, a nearby rural stream. As with any comparison between streams, the differences in streamflow cannot be attributed solely to land use, but may also reflect differences in geology, topography, basin size and shape, and storm patterns. The hydrologic effects of urban development often are greatest in small stream basins where, prior to development, much of the precipitation falling on the basin would have become subsurface flow, recharging aquifers or discharging to the stream network further downstream. Moreover, urban development can completely transform the landscape in a small stream basin, unlike in larger river basins where areas with natural vegetation and soil are likely to be retained. Development along stream channels and floodplains can alter the capacity of a channel to convey water and can increase the height of the water surface (also known as stage) corresponding to a given discharge. In particular, structures that encroach on the floodplain, such as bridges, can increase upstream flooding by narrowing the width of the channel and increasing the channel’s resistance to flow. As a result, the water is at a higher stage as it flows past the obstruction, creating a backwater that will inundate a larger area upstream. Road washed out by a flood in West Virginia. Source: A. Rothstein, Farm Security Administration. Sediment and debris carried by floodwaters can further constrict a channel and increase flooding. This hazard is greatest upstream of culverts, bridges, or other places where debris collects. Small stream channels can be filled with sediment or become clogged with debris, because of undersized culverts, for example. This creates a closed basin with no outlet for runoff. Although channels can be engineered to convey floodwater and debris quickly downstream, the local benefits of this approach must be balanced against the possibility of increased flooding downstream. Erosion in urban streams represents another consequence of urban development. Frequent flooding in urban streams increases channel and bank erosion. Where channels have been straightened and vegetation has been removed from channel banks, streamflow velocities will increase, allowing a stream to transport more sediment. In many urban areas, stream-bank erosion represents an ongoing threat to roads, bridges, and other structures that is difficult to control even by hardening stream banks. 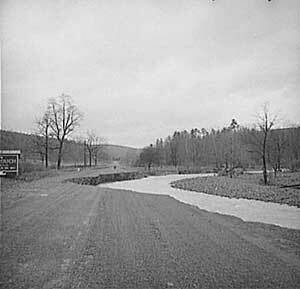 Annual maximum discharge increased with urban development in Mercer Creek from 1960 to 2000, but remained essentially the same in nearby rural Newaukum Creek during that period. 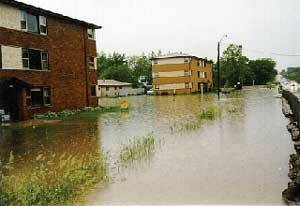 Common consequences of urban development are increased peak discharge and frequency of floods. Typically, the annual maximum discharge in a stream will increase as urban development occurs, although the increase is sometimes masked by substantial year-to-year variation in storms, as is apparent in the annual maximum discharge for Mercer Creek from 1960 to 2000. In comparison, the annual maximum discharge for rural Newaukum Creek varied during the period but showed no clear trend. The effects of development in urban basins are most pronounced for moderate storms following dry periods. For larger storms during wet periods, the soil in rural basins becomes saturated and additional rainfall or snowmelt runs off much as it does in an urban basin. The relative increase in peak discharge is greater for frequent, small floods than infrequent, large floods. The relative increase in annual maximum discharge in Salt Creek, Illinois, (USGS gaging station 05531500) has been greater for small floods (solid line, less than 95 percent of the annual peaks for the period of record) than for large floods (dashed line, more than 95 percent of the annual peaks for the period of record). The number of times per year that daily discharge in the Northeast Branch of the Anacostia River, Maryland, (USGS gaging station 01649500) was greater than 1,000 ft3/s has increased over time. The effect of urban development in the last half of the 20th century on small floods is evident in Salt Creek, Illinois. With the exception of an unusually large flood in 1987, large floods have increased by about 100 percent (from about 1,000 cubic feet per second to about 2,000 ft3/s) while small floods have increased by about 200 percent (from about 400 ft3/s to 1,200 ft3/s). Nonetheless, even a small increase in the peak discharge of a large flood can increase flood damages. The frequency of moderate flooding can increase substantially after development. The annual frequency that daily discharge exceeded 1,000 ft3/s on the Northeast Branch of the Anacostia River in Maryland increased from once or twice per year in the 1940s and 1950s to as much as six times per year in the 1990s. Floodwalls along Willow Creek in Rosemont, Illinois. Source: Kevin D. Richards, U.S. Geological Survey. There are many approaches for reducing flood hazards in basins under development. Areas identified as flood-prone have been used for parks and playgrounds that can tolerate occasional flooding. Buildings and bridges have been elevated, protected with floodwalls and levees, or designed to withstand temporary inundation. Drainage systems have been expanded to increase their capacity for detaining and conveying high streamflows; for example, by using rooftops and parking lots to store water. 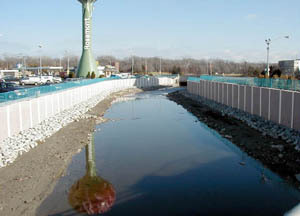 Techniques that promote infiltration and storage of water in the soil column, such as infiltration trenches, permeable pavements, soil amendments, and reducing impermeable surfaces have also been incorporated into new and existing residential and commercial developments to reduce runoff from these areas. Wet-season runoff from a neighborhood in Seattle, Washington, was reduced by 98 percent by reducing the width of the street and incorporating vegetated swales and native plants in the street right-of-way. In response to frequent flooding along the Napa River in California, the local community integrated many of these approaches into a single plan for flood protection that is expected to reduce flood damage while helping to restore the river ecosystem. The plan involves bridge reconstruction, levee setbacks, a floodwall, moving of vulnerable structures, detention basins, larger stormwater conveyances, and a high-flow bypass channel. The U.S. Geological Survey in cooperation with the City of Charlotte and Mecklenburg County, North Carolina, developed a flood information and notification system (FINS) to address the need for prompt notification of flood conditions in urban areas where streams rise and fall rapidly. FINS is based on a large network of streamflow gaging and rainfall stations that broadcast information within minutes of being recorded via radio telemetry. The system automatically notifies the National Weather Service and emergency responders in the region when rainfall and streamflow indicate the likelihood of flooding, giving these agencies additional time to issue warnings and evacuate areas if necessary. Urbanization generally increases the size and frequency of floods and may expose communities to increasing flood hazards. Current streamflow information provides a scientific foundation for flood planning and management in urban areas. Because flood hazard maps based on streamflow data from a few decades ago may no longer be accurate today, floodplain managers need new peak streamflow data to update flood frequency analyses and flood maps in areas with recent urbanization. Streamflow-gaging stations provide a continuous record of streamflow that can be used in the design of new urban infrastructure including roads, bridges, culverts, channels, and detention structures. Stormwater managers can use streamflow information in combination with rainfall records to evaluate innovative solutions for reducing runoff from urban areas. Real-time streamflow-gaging stations, which make streamflow and rainfall data available via the internet and other communications networks as they are recorded, offer multiple benefits in urban watersheds. In particular, they provide flood managers with information that can guide flood control operations and emergency actions such as evacuations and road closures. Anderson, D.G., 1968, Effects of urban development on floods in northern Virginia: U.S. Geological Survey Water-Supply Paper 2001-C, 22 p.
Bailey, J.F., Thomas, W.O., Wetzel, K.L. and Ross, T.J., 1989, Estimation of flood-frequency characteristics and the effects of urbanization for streams in the Philadelphia, Pennsylvania area: U.S. Geological Survey Water-Resources Investigations Report 87-4194, 71 p.
Carter, R.W., 1961, Magnitude and frequency of floods in suburban areas: U.S. Geological Survey Professional Paper 424-B, p. 9-11. Hollis, G.E., 1975, The effects of urbanization on floods of different recurrence intervals: Water Resources Research, v. 11, no. 3, p. 431-435. Horner, R.R., Lim, H., and Burges, S.J., 2002, Hydrologic monitoring of the Seattle Ultra-urban stormwater management projects: University of Washington, Department of Civil and Environmental Engineering, Water Resources Series Technical Report 170, 31 p.
James, J.D., 1965, Using a digital computer to estimate the effects of urban development on flood peaks: Water Resources Research, v. 1, no. 2, p. 223-234. Konrad, C.P., and Booth, D.B., 2002, Hydrologic trends associated with urban development for selected streams in western Washington: U.S. Geological Survey Water-Resources Investigations Report 02-4040, 40 p., accessed on July 16, 2003, http://water.usgs.gov/pubs/wri/wri024040. Leopold, L.B., 1968, Hydrology for urban land planning -- A guidebook of the hydrologic effects of urban land use: U.S. Geological Survey Circular 554, 18 p.
Sauer, V.B., Thomas, W.O., Jr., Stricker, V.A., and Wilson, K.V., Flood characteristics of urban watersheds in the United States: U.S. Geological Survey Water-Supply Paper 2207, 63 p.
U.S. Geological Survey, 2003, USGS hydrologic data in and around Mecklenburg County, N.C., accessed October 27, 2003, at http://nc.water.usgs.gov/char/. Zarriello, P.J., 1998, A Precipitation-runoff model for part of the Ninemile Creek watershed near Camillus, Onondaga County, New York: U.S. Geological Survey Water-Resources Investigations Report 98-4201, 60 p., accessed on July 16, 2003, at http://ny.water.usgs.gov/pubs/wri/wri984201. Send questions or comments about this report to the author, C.P. Konrad, (253) 428-3600 ext. 2634. For more information about USGS activities in Washington, visit the USGS Washington District home page.